All on Four (or Teeth Now), is a revolutionary new technique whereby a whole arch of failing teeth is replaced with dental implants in a single visit. The teeth are removed, implants placed and high-quality fixed temporary teeth are fitted, all without the patient needing to leave the Clinic. 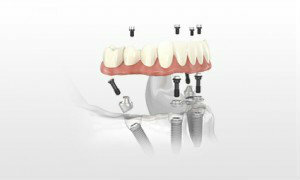 who currently wear upper and/or lower dentures.